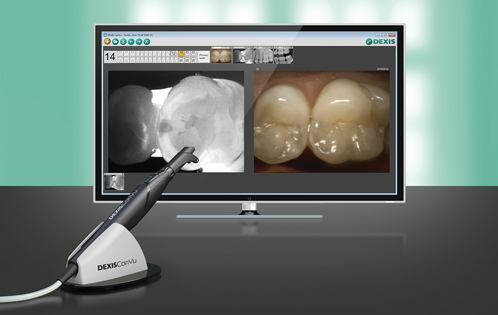 Continuing with our commitment to using the latest dental technologies, we are excited to announce the addition of the DEXIS CariVu system. CariVu is a cavity detection device, which illuminates teeth using near-infrared light. This lets us actually "see" inside your teeth. When used together with digital x-rays, we can now get the most accurate diagnosis possible of cavities and/or cracks in your teeth. CariVu has a hand piece that fits over your tooth. This hand piece shines a safe, bright light directly into the tooth. A digital camera on the unit transmits almost x-ray like images into our computer for diagnosis. In these images, healthy tooth enamel shows off its translucency and appears almost clear, but damaged or decayed enamel shows off as a darker grey or black.